Twelve people have been injured one moderately so after a taxi and a car collided on Old Main Road and Platt Road in Isipingo just after 10:30 on Saturday. 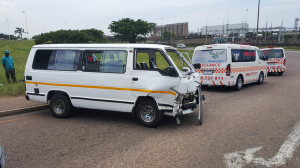 Rescue Care Paramedics arrived on the scene to find that a taxi and a car had collided before the taxi collided with a robot and stopping some distance away from the initial scene. A total of twelve people had sustained injuries with one person sustaining moderate injuries. More ambulances were called to assist with transporting the injured. Once all of the injured were stabilised on the scene they were transported to various Durban hospitals for the further care that they required. At this stage it is unclear what caused the collision however SAPS were on the scene and will be investigating further. 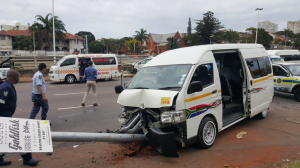 Seventeen people have been injured two seriously so after a taxi and two cars collided on Berea Road and Essenwood Road in Durban just after 9am on Saturday morning. Rescue Care Paramedics arrived on the scene to find that a taxi and two cars had collided before the taxi lost control and collided with a light pole. Paramedics found that seventeen people had sustained injuries ranging from mild to serious. More ambulances were called to assist and the injured were stabilised on the scene before being transported to various Durban Hospitals for the further care that they required. 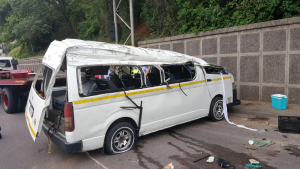 A collision between a Taxi and a Bakkie has left twenty six people injured, three critically so on the N3 Durban bound before Tollgate Bridge just after 2pm today. Rescue Care Paramedics arrived on the scene to find total chaos as passengers from both vehicles lay scattered on the national freeway. A Taxi and a Bakkie had collided before both vehicles rolled several times ejecting passengers from both vehicles. Three people one being a ten year old had sustained critical injuries and was stabilized on the scene by Advanced Life Support Paramedics. More ambulances were dispatched to assist in the multiple casualty scene. Once all of the injured had been stabilized on the scene they were transported to various Durban Hospitals for the further care that they required. It is unclear what caused the collision however SAPS were on the scene and will be investigating further.